FilASewphie: I'm getting bored--prom dress photo! Okay, so I was originally going to wait for a few more prom photos, but I got bored waiting for them. So I'm posting the one photo I have, and will just make a new post if/when the others show up. I think that this prom dress worked out quite well. 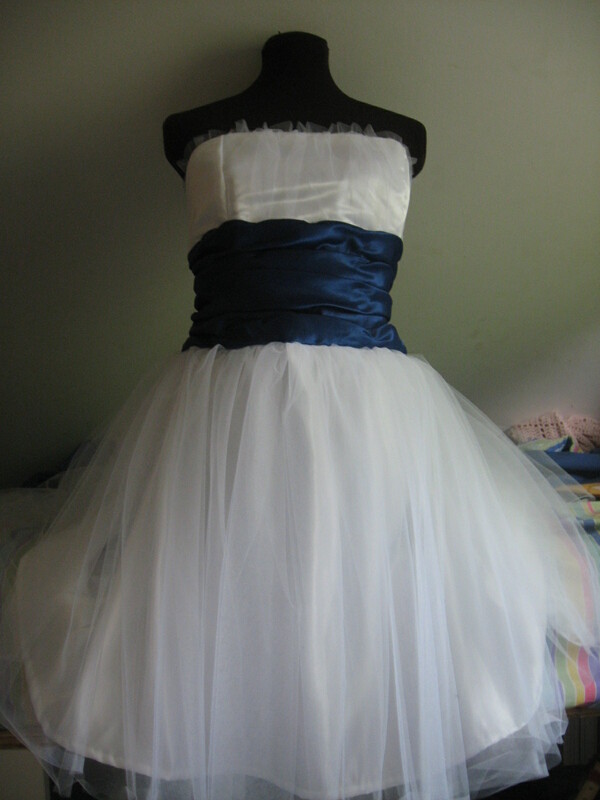 Quite honestly, when my friend A described the dress she wanted, I thought a white dress with a blue sash would look weird. I'm very glad I trusted her judgment, because it turned out looking beautiful! We didn't quite follow the pattern--we shortened the skirt and left off all the ribbons, beads, and trims Simplicity wanted us to sew onto the sash. I went over to A's house the afternoon before prom, so I got to see her in dress and make-up and shoes and everything. She looked beautiful! A took the extra fabric from her sash and sewed her date's tie and handkerchief herself. Oh wow Sophie, it's beautiful!! I never would've thought white and blue would work this well together, the dress is gorgeous, nice job!! I'm secretly hoping A will let us see the prom pic with makeup and everything? Thank you! I would never have thought it would work this well either. I'm sure that she will, it's just a matter of waiting until the photos get sorted out. There is a photo somewhere of her all dressed up with me, but at this point I'm not sure who has it. Gorgeous! It looks like a Betsy Dress! dreamy dress. i love all the white frothiness on the skirt.